Throughout her decades-long career, Dr. Buzby’s philosophy has been about empowering and inspiring pet owners to know that they are a valuable part of their pet’s healthcare team. She works to educate, explain, provide moral support and better equip pet owners to be more prepared to help their furry family members. But she realized that as a private veterinarian, covering traditional and holistic medicinal approaches, she could only touch so many animals, and Dr. Buzby wanted to have a bigger impact. Grey Muzzle: What inspired you to create a podcast? Dr. Buzby: I’ve always been interested in how I can help people help their pets and I know that many dog owners are proactive in their pet’s care. They don’t just want to have a 15-minute visit at the vet, give their dog meds and go back in six months. They want to know and understand as much as possible about their dog’s health and be involved in the decision making process. I’ve always been a fan of a three-pronged approach to working with patients: innovative products, building community and educating pet owners. ToeGrips have allowed me to do that in a way that is much different than private practice. A podcast is another great tool. I have the podcast episodes transcribed into blogs and disseminate them on social media. So, it’s another way to use technology to further my mission. GM: How has your podcast been going since you launched? DB: I’ve been having fun. I love it. I did have this moment after the first episode where I thought, “Is this going to be as helpful as I want it to be?” but I’ve gotten some feedback, which I’m thankful for. One of my friends was listening to an episode in her car and a lady with a Great Dane pulled up next to her at a traffic light and asked what radio station she was listening to. If I can help one person, then I’m happy. GM: Who are you trying to reach and what are you trying to accomplish? DB: I originally was focused on senior dog issues only, but it didn’t take long for that to expand. I decided to focus on all dogs and helping dog owners that are proactive in their pet’s care. There are so many caring dog owners out there who wouldn’t necessarily do something for themselves, but they’ll do anything for their dogs. Those are my people. I sometimes affectionately call them the DIYers - they are interested and active in caring for their dogs in all aspects - nutrition, exercise, healthcare, etc. They are not just owners, but rather advocates. GM: What are some of the topics you cover? DB: There’s a lot I want to share. Here are some of the recent topics. Anesthesia for senior dogs - I share an emotional story of losing a senior dog under anesthesia, and why I would do it all over again. The podcast also details how to have a frank conversation with your vet on what is best for your dog and how to weigh the benefits vs. the risks of surgery. Six secrets for a happier vet visit - This episode is all about the role a pet parent can play in facilitating a quality, stress-free vet visit that’s both productive and positive for everyone. Ten touches that can save your dog’s life - minutes, once a week. You’re always looking for changes you can communicate to your vet. Prevention like this can save money by not letting things get out of hand, but more importantly, save a life. I’m also developing it into a video tutorial series. And there’s lots of other topics too, like nail trimming secrets, helping your dog take medications, insomnia in dogs...the list goes on and on! GM: Why should someone listen to your podcast? What would they gain? DB: If you are someone who wants to learn how to be your dog’s advocate from a healthcare standpoint and be a better partner with your veterinarian, then this podcast is definitely for you. I think people will learn how to communicate with their vet more effectively as well as gain hands-on knowledge about dozens of things that dogs can face. The content is all born from cases that I’ve seen in practice, so it’s all real deal. My end goal is simply to empower people with fresh information and support information with innovative products. I want to give people all the resources they need to best care for their dog in the most “wholistic” way possible. About the Author: Dr. Julie Buzby graduated from Kansas State University College of Veterinary Medicine in 1997 and began her career caring for dogs, cats and horses. To augment her Western training, she earned certification by the American Veterinary Chiropractic Association in 1998, and by the International Veterinary Acupuncture Society in 2002. As an integrative veterinarian, Dr. Buzby seeks to integrate the best of Western medicine, alternative therapies, and creative tools for maximum wellness in her patients. She has a special interest in preserving mobility and quality of life for senior dogs and proudly serves on the Advisory Board of the Grey Muzzle Organization. 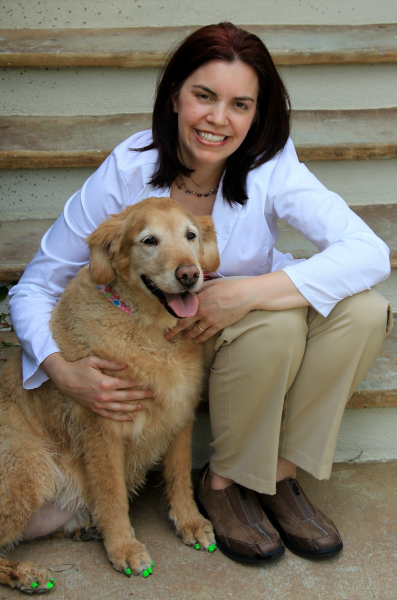 In 2012, Julie founded Dr. Buzby’s Innovations, with the mission of helping people help their dogs. ToeGrips, the company’s flagship product, offer a natural alternative to dog boots and dog socks on hardwood floors. They have helped dogs regain confident mobility in 55 countries around the world. In 2016, the company evolved into “Dr. Buzby’s,” a brand focused on educating and empowering people who care about the best care possible for their dogs. Check out the Buzby Bark and Dr. Buzby’s innovative dog health products at https://toegrips.com. Listen to and subscribe to The Buzby Dog Podcast at iTunes or Google Play.